We don’t get the chance to write about local blues acts as much as we’d like these days, so we’re always glad when the Blues Society of Western Pennsylvania (BSWPA) gives us a good reason to do so with another compilation of songs from various Pittsburgh area blues artists. 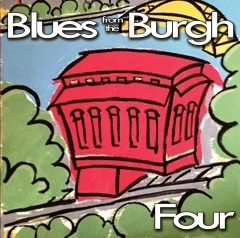 Now on the fourth installment of its Blues from the Burgh series, BSWPA has again managed to put together a nice assortment of tracks – arguably the finest to-date – from some of the region’s best blues players, including mainstays such as Jill West and Blues Attack, Mahajibee, and Jimmy Adler, as well as a number of up-and-coming and emerging acts. The set kicks off with the slow blues grooves of Mahajibee‘s “Find My Way Home” and Billy the Kid and the Regulators‘ gritty “She Got a Hold on Me” before Vince Agwada kicks in the door with an Eric Gales-style “Blindsided” that serves as one of the collection’s highlights. The same can also be said of the breezy “Exile Blues” (Dan Bubien) that follows, with its catchy harmonica, keyboards, and guitar combining with lyrics such as “when you leave, it won’t be long, ’til my heart dies alone in this room”. A bit later comes the rich Chicago style blues of The Rhythm Aces‘ soulful “No Baggage”, featuring and written by the Pittsburgh blues institution that is Bubs McKeg, while guitarist Gregg Krupa handles the lead vocals on Jill West & Blues Attack‘s country-flavored “Whiskey”, with West on background vocals. The Blues Orphans offer a shuffling, horn-accompanied ode to a city landmark in “Rivers Casino” (a “big shiny building, that’s where all the money goes”), as Melinda provides one of the album’s most driving tracks (along with the aforementioned “Blindsided”) with the gritty “Trouble” from her new album Witness. Jimmy Adler‘s “Wild Imagination” is a swinging blues number in his typical style, followed by the delta country blues of Rich Harper‘s “Watch Out for That Girl” and the Bob Margolin-like vocals of a creeping “Redemption” from the Blues Devils, with songs from the Bottom Shelf Blues Band (the simmering “Born to Blues”), Stevie Pete (the rockabilly “Don’t Do That”, a one-man show with Pete providing guitar, lap steel, accordion, bass and drums in addition to vocals), Ruby Red & the Dirty Devils (the slinking, Spanish guitared “Gypsy Blues”), and Leigh-Anne Yost (the slow country shuffle of “This Whiskey”) completing the setlist. Regardless of whether or not you call the Steel City home, Blues from the Burgh 4 is a solid set worth tracking down, almost like a blues festival made up of all local acts. We don’t yet see the CD for sale on the BSWPA’s website, but we’re betting there will be plenty of copies available at the society’s tent for this weekend’s Pittsburgh Blues Festival, where several of the artists – Mahajibee, Jill West, and Billy the Kid, among them – are also scheduled to perform, in between such national acts as Dr. John, JJ Grey and Mofro, Bernard Allison, Trampled Under Foot, Albert Cummings, and the Spin Doctors. This entry was posted in Albums and tagged Albert Cummings, Bernard Allison, Billy the Kid & the Regulators, Blues Devils, Blues Orphans, Blues Society of Western Pa., Bottom Shelf Blues Band, Bubs McKeg, Dan Bubien, Dr. John, Gregg Krupa, Jill West & Blues Attack, Jimmy Adler, JJ Grey & Mofro, Leigh-Anne Yost, Mahajibee, Melinda, Pittsburgh Blues Festival, Rich Harper, Ruby Red & the Dirty Devils, Spin Doctors, Stevie Pete, The Rhythm Aces, Trampled Under Foot, Vince Agwada. Bookmark the permalink.